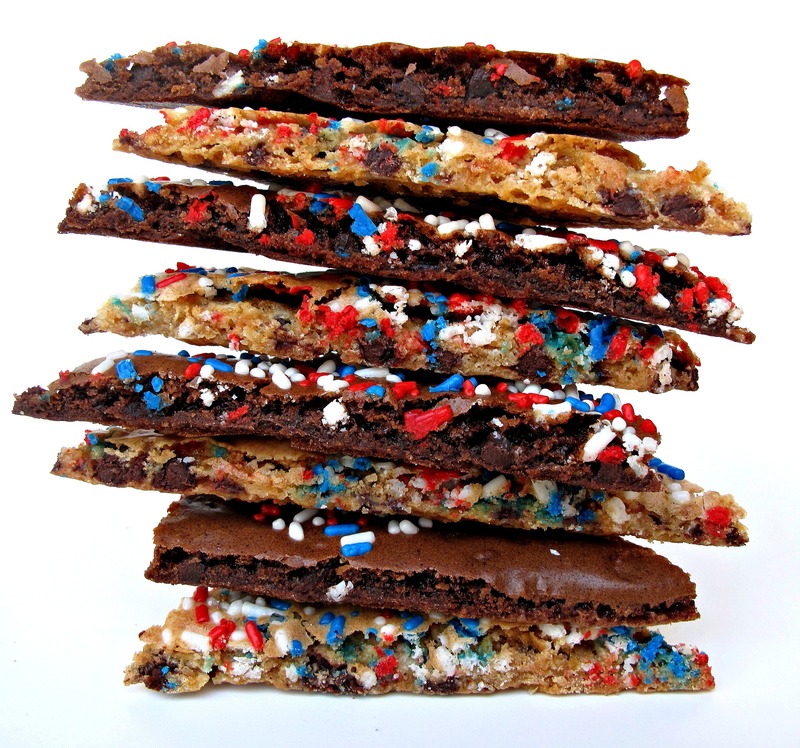 Patriotic Cookie and Brownie Crunch is thin, crispy brownie and chocolate chip cookie brittle spangled with red, white, and blue! For Memorial Day, July 4th, or any day you want to bake a patriotic snack! I will be honest. Most of my life Memorial Day meant the end of the school year, swimming pools opening, and barbecues. Though aware of the purpose of Memorial Day as a day to remember the men and women who died serving our country in the Armed Forces, I spent very little time thinking about it. It is easiest not to think about difficult subjects. But for many reasons, I believe it is wrong to avoid this one. Memorial Day isn’t about political beliefs or philosophical convictions concerning war and peace. Memorial Day honors real people who gave their lives so that the rest of us could live our daily lives as we do. It is a day to thank them, and their loved ones, for their bravery and sacrifice. It is also a day to demonstrate to the men and women currently serving, that the job they are doing is an honored and appreciated one, that they and those who served before them are not forgotten. As we celebrate this Memorial Day, I suggest sending a thought or prayer honoring the military men and women who have chosen this very difficult and dangerous job. I will also be sending a donation to Snowball Express. This wonderful organization provides services to the children of fallen military heroes. Please click over and read about their important work. In a tiny way, I want to say, “Thank you”. If you think a tiny gesture is meaningless, I am about to prove you wrong. You may have read other posts where I have mentioned the blog Gina Has Left the Mall. Gina has opened my eyes, mind, and heart to a subject I have always avoided thinking about. Through Gina’s blog I learned about Cup of Joe. For a $2 donation online to Cup of Joe, anyone can purchase a cup of coffee that is gifted to a service person, as a gesture of thanks and support. If the donor provides an email address, the recipient of the gift often sends a short note in return. I was dubious that such a small gesture could have any impact, but I quickly learned that one cup of coffee can go a long way to warming a heart. The following are a few of the email notes I have received. Desert safe Patriotic Cookie and Brownie Crunch treats are in honor of our military heroes past and present. They are great for a patriotic celebration or for care package sharing. I appear to always be light years behind on baking trends. I had never heard of crispy brownies until I found a recipe on the King Arthur site. 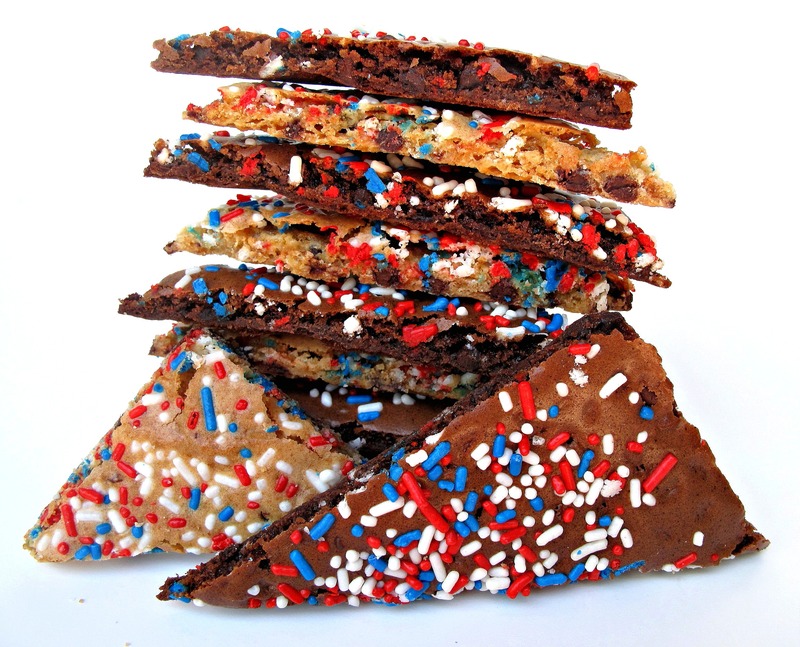 Then, googling the recipe, I found I may possibly be the only person on earth who hadn’t heard of brownie crunch, but no one I found mentioned that these cookies are great for care packages. Stored airtight at room temperature, the crunch stays crunchy and delicious for at least 2-3 weeks! Though the crisp texture makes these more prone to breaking when mailing, careful packaging to minimize wiggle room keeps the cookie crisps intact. If you are eating these at home, no worries about careful packaging. 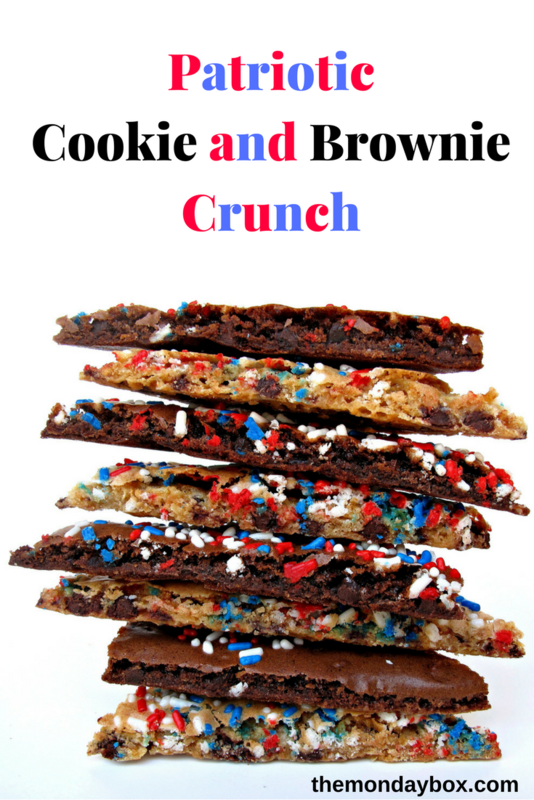 Patriotic Cookie and Brownie Crunch is addictive and it is unlikely you will be storing any at all. 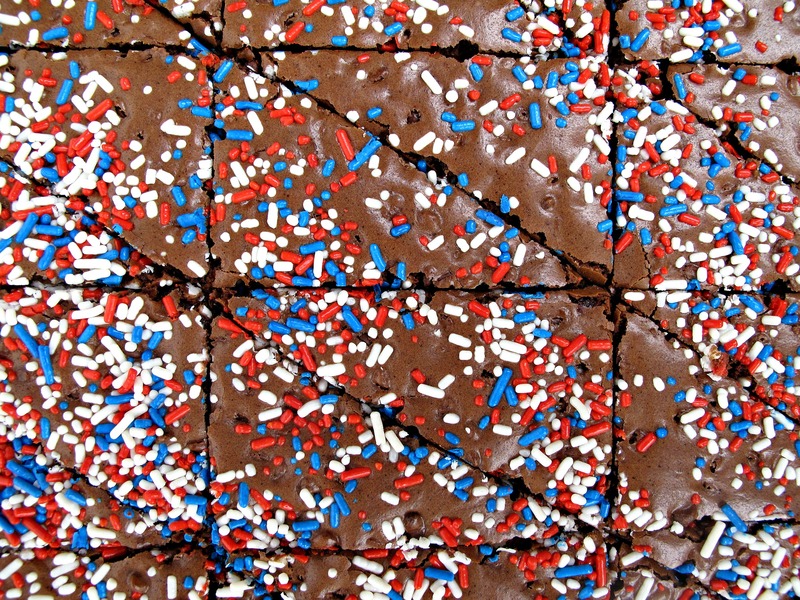 Patriotic Cookie and Brownie Crunch should be enjoyed year round. 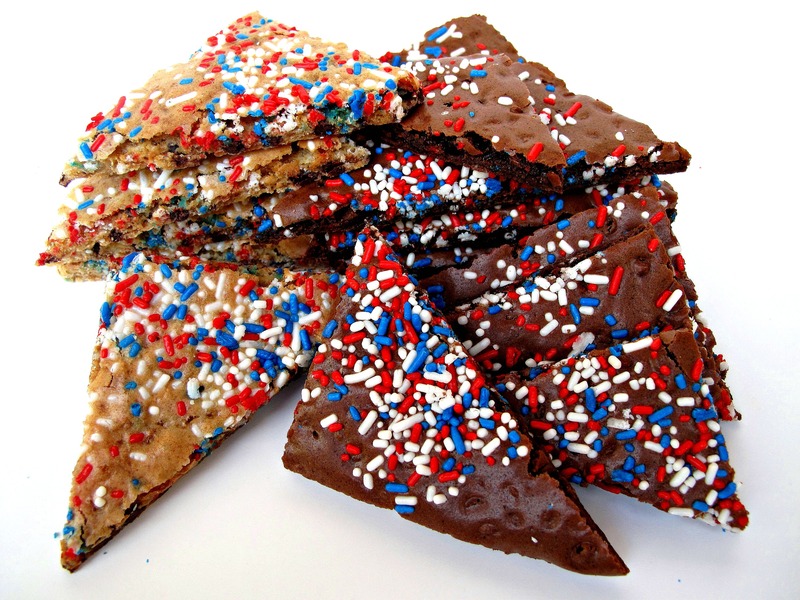 The “patriotic” part of these crisp cookies is only the red, white, and blue sprinkles, just a little thing. But sometimes little things can make a difference. Happy Memorial Day! In a medium bowl, whisk together flour, salt, and baking soda. In the bowl of an electric mixer, whisk the egg whites until foamy. Mix in sugar, cocoa powder (if using), espresso powder (if using), oil, vanilla, and powdered milk. Pour the batter onto the prepared baking sheet and use a spatula to spread at thin as possible. Return to oven and bake an additional 5 minutes. Remove from the oven and allow to cool completely on the baking sheet before separating cookie pieces. The Crunch crisps as it is cooling. If for any reason the cookies aren’t completely crisp once cool, return them to the oven for a few minutes of extra crisping time. Store in an airtight container at room temperature for at least 2-3 weeks. Rectangle shapes travel better than triangles. Double wrap short stacks of 4 or 5 pieces of Crunch in plastic wrap before placing in airtight containers. Make sure to pack without wiggle room using tissue paper is necessary. Plastic storage containers offer more protection than ziplock bags against breakage. The brittle looks fantastic and I’m sure it tastes it too! Thanks for taking the time out to say a few words for our fallen soldiers and those currently serving. It’s much appreciated by this Mama! Have a wonderful weekend. Thanks, Jennifer! 🙂 Have a happy Memorial Day! Gina, as you know I was interested in learning about military care packages when I started The Monday Box, but truly it was your blog that made me think about our troops as someone’s sons and daughters that need and deserve our thanks, support, and encouragement. I thank you for not only presenting the realities of life for members of our armed forces but ways that each of us can make a difference. Bridging the understanding gap between the military and civilians is complex and you do it so well! 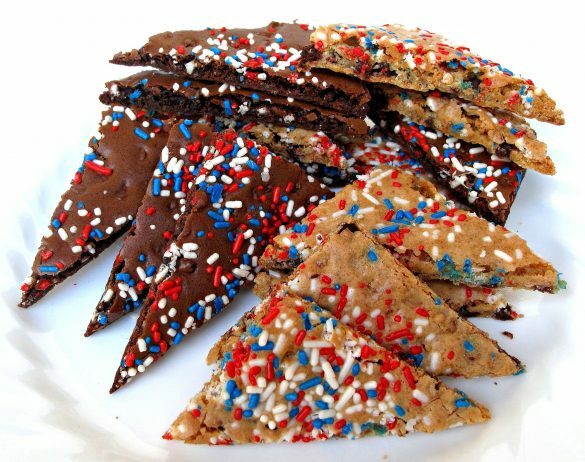 I’ve seen brownie brittle all over the place recently (like, at the store in bags) and i’ve often wondered how one goes about making it. I’ve thought about trying to do one myself, but just hadn’t gotten around to it yet. Now i don’t even have to, because i’m going to make yours sometime this summer. I bet it’s wonderful! I am do things in reverse, Shannon. I never noticed the stuff in the store until I had made this recipe! 🙂 Apparently, the craze all started with the stuff in the store, which I haven’t tried yet but is supposed to be amazing. Bloggers started attempting to duplicate it (no one has been able to get it perfectly so far, as far as I can tell) and this King Arthur recipe is the result. I worry about you trying it because I can foresee months and months of brittle recipe experiments as you perfect it. 🙂 I have no doubt you would be successful, and I volunteer to take unwanted batches off your hands, but I don’t want to be responsible for any new baking obsessions. 🙂 Have a great weekend! 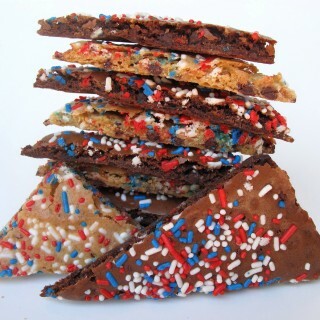 Love the sound and look of your cookie and brownie brittle. I’ve not tasted or made them before. Thanks for the reminder about Memorial Day being beyond a day off or a chance to barbecue. I really enjoyed learning about “Cup of Joe” – I’m going to talk to my little one about that and it’s something we can easily do. Thank you! Thank YOU, Monica! If you take a look at Gina’s blog, her first post explains how her 4 year old’s chance interaction with a veteran changed their perspective and importantly impacted their lives. Little ones have a way of seeing through to the heart of a matter. 🙂 I think sharing a smile is can be a small but significant act. Have a joyful Memorial Day! I’ve never heard of brownie brittle either! The cup of joe idea is a lovely one 🙂 these look delicious! Wendy – this was so well written – thank you for the reminder. I am humbled by the sacrifices that have been made to keep me safe at home. Whenever I come up with something I think is a great idea, I often make the mistake of googling it. Why I don’t know. I should just let myself think I was the first person in the whole world who came up with it. When I look around the web, I often find my original thoughts have been shared with millions! I also salute those who can create out-of-the-box delicious new recipes! Hope you have a great week. Thank you for this : ) My husband served for many years before only recently transitioning out of the military. It can be so easy to forget that Memorial Day is more than a day off from work. Actually, thank you and your husband, Ashley! 🙂 I appreciate his service and the sacrifices the two of you made while he served. Unless you know someone in the military, it is too easy not to think about the men and women who put themselves in harms way in defense of their/our country. But I believe that it’s essential that we take the time to let them know they are appreciated and not forgotten as they do their very difficult and dangerous job. 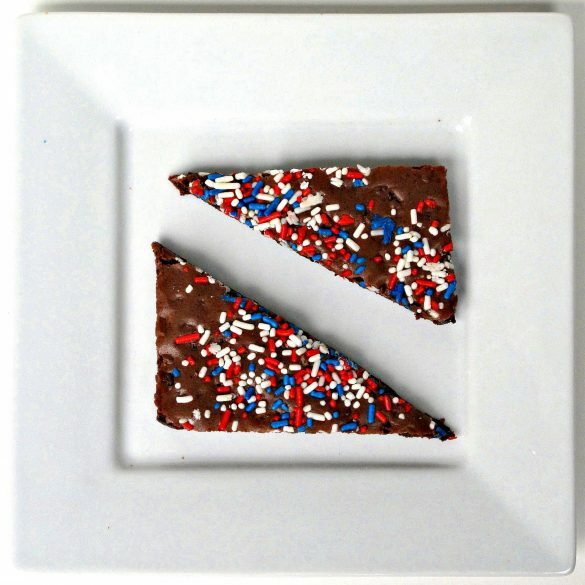 What a unique brittle! Looks absolutely delicious! I am awed by people who are willing to give up their lives for us. That is such a sweet gesture. Thanks for telling us about it. Hi again, I decided to make this tonight instead of the moon cookies since don’t have the candies yet. Your Oreo biscotti was a hit, I mailed it out today. Please tell me what I’ve done wrong… When I tried to spread out the batter I was pulling the chocolate chips to the edge also so the middle looked bare ended up putting more chips. The house smelled so good, thank you for a great recipe! Hi, Helen! I am so happy that you are enjoying the Monday Box recipes and finding them useful!! I know the mailed Oreo Biscotti will be a hit! 🙂 You did nothing wrong on the brittle. Did you use mini-chips? The original recipe called for 1 cup of regular chips. One half cup was used in the batter and one half cup was sprinkled on top. I felt that for mailing, less gooey chips on top would be better. Plus, I was using sprinkles that covered up any blank spots. I use mini chips because they spread out more evenly. If your method of extra chips worked. Great! Enjoy! If you think it came out too gooey or wouldn’t get crisp and you want to use less chips, try plopping 4 or 5 scoops of batter around the baking sheet and then spread them out and together. Less moving around of the batter might provide less chipless spots. Thank you for your enthusiasm and for keeping me updated on your baking adventures! It came out great even I put more chips, oh.. I also put chopped almond on top. I even put it back in the oven for another 5 minutes. My husband loves it, he said goes perfect with his tall glass of milk. Yah! I wish I can send you a picture of it… Looked so good again thank you so much for the recipe. These do look like something I’d have a hard time stopping! Delish!! Thanks for bringing it by Throwback Thursday! Thanks, Mollie! They are a lot like the brownie brittle that is sold at the supermarket. Very crunchy and addictive! Thanks for hosting Throwback Thursday! These sound so yummy! Pinned. 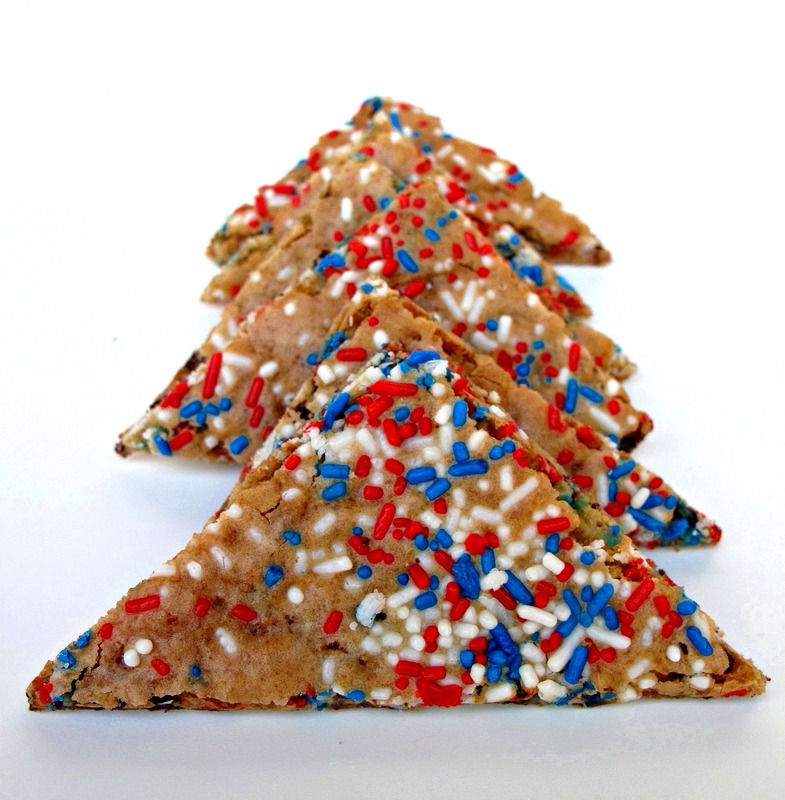 These sound delicious and very patriotic for July 4 afternoon tea! Thanks so much for linking up with us at #overthemoon. I’ve shared on social media. Have a great week and look forward to you link up next week. Thank you, Sue! Thanks also for sharing and for hosting Over the Moon!